PLEASE NOTE: The Aduana checkpoints south of Nogales on Mex 15 (KM21) , south of Naco on Son 089 (Mututicachi) and south of Agua Prieta (Fronteres) have been closed. You are no longer required to stop and show your vehicle permit. Even though the check points are gone, the legal requirement to have a valid vehicle permit when driving outside of the Sonora Free Zone remains in force. Call us if you have questions. There are three crossing you will likely use to visit the Rio Sonora. Nogales, Naco or Douglas/Agua Prieta. The procedure to get your documents is the same at all crossings but the physical layouts are very different. Read the general info then check the section for your specific crossing. Passport – You will need a passport to obtain a visa and to reenter to the USA. Vehicle registration (Vehicle registration must be in the driver’s name). A lease contract if the vehicle is leased or a rental contract if rented. If you have a loan on the vehicle and the lien is noted on your registration get a notarized letter from the finance company allowing you to bring the vehicle across the border for the period you will be in Mexico. A US or Canadian Driver’s License or a valid international driver’s license. Photocopies (2) of each of the documents. Note: you will still need to pay for a copy of your newly acquired visa. A major credit card in the same name as the vehicle papers and your passport or cash if are getting a Sonora Only permit. Mexican vehicle insurance. Your US or Canadian insurance is not valid in Mexico. You may want to talk to your current agent or search for Mexican Insurance online. Many policies can be purchased online and printed on your printer. More than 5 liters of wine per person. More than 1 liter of liquor. Large quantities of anything that could be construed as being offered for sale (clothing, including used clothing, tools, etc.). Crossing into Mexico may involve interaction with the US Border Patrol, Mexican Customs, Mexican Immigration and the Banjercito Vehicle Permit office. US Border Patrol officers may stop you as you are about to leave the USA and ask if you are bringing large sums of cash or guns into Mexico. Bringing guns into Mexico is illegal – don’t do it. (If you are going to a hunting ranch then you will have to make special arrangements prior to your trip and obtain gun permits from the Mexican government. The hunting outfitters will assist you. Do not enter Mexico without proper authorization for your firearms and follow the instructions provided by your hunting outfitter.) In some cases, you may be asked to step out of your vehicle while it is given a cursory inspection or even x-rayed from the outside by a special van. Regardless of which crossing you use, you should take the “Nothing to Declare” lane and expect a green light. With a green light, you may proceed without any other vehicle inspection. If you get a red light, Mexican officers will wave you over to the right for a customs inspection. You may be asked to open your vehicle and asked where you are going and what you have in the vehicle. The officers will have varying degrees of skill in English, ranging from excellent to almost none but they will be professional and courteous. As long as you have no contraband, you will be on your way quickly. The Banjercito (Bank of the Army) The Bank handles the cash and credit card transactions for vehicle permits. The Banjercito is the most trusted agency in Mexico and will handle your transaction honestly and professionally. Visas Always obtain your tourist card/visa first then the vehicle permit. Visas may be issued for 7 days or 180 days. The 7-day visa is free but be aware that the vehicle permit will be co-terminus with the visa. A 180 day visa costs about 260 pesos ($20 at an exchange rate of 13 pesos to the dollar). If the immigration office stamps your passport when you enter be sure to get an exit stamp when you leave. A permit is required to drive beyond the Free Zone. The zone is described as North of Mexico Highway 2 extending west of from Agua Prieta and west of Mexico Highway 15 to the beach and from Nogales to Empalme on the South. The Rio Sonora is outside of this zone. It is possible to drive to the Rio Sonora without obtaining a permit but this is technically a violation of Mexican vehicle import rules and while we have never seen this happen, you vehicle may be impounded. There are two types of of temporary vehicle importation permits (TVIP) available as of this writing. There is the National permit which allows you to drive your vehicle anywhere in Mexico and the Sonora Only permit which, as the name implies, limits driving within the state. The National permit will cost about $50 depending on the exchange rate. It will be co-terminus with your visa – either 7 days or 180 days. A recent change in the requirements of the National permit is that you must pay a deposit ranging from $200 to $400 to guarantee that you will return the vehicle to the US. You may pay cash or use your credit card. When you turn in the permit at the end of your visit, your deposit will be refunded to you. If you fail to turn in the permit you will forfeit your deposit and not be allowed to bring in any vehicle until the original vehicle is presented at the border. As stated above, the Banjercito is trustworthy and there is no need to worry about not getting your deposit back. The Sonora Only permit is about $50, again depending on the exchange rate and there is no deposit required but you must pay in cash. Again, it will be issued for 7 or 180 days, to match your visa. It is important to verify the VIN number on the permit to make sure it is correct before you sign it. An uncorrected typo on the permit will cause headaches when you return the permit. You may exit and re-enter Mexico freely during the term of the permit without turning it in but you must return the permit on or before the expiration date. If you fail to do this, you will forfeit your deposit and you will have difficulty obtaining a new permit. Be sure to turn in your visa as well. Note that you can only have a permit on one vehicle (car or motorcycle) at a time. Crossing at Nogales: Note: Construction at the border crossing is now complete with reduced wait times. Use the Mariposa crossing, Highway 189, exit 4 from I-19. At the bottom of the ramp, turn right on Highway 189 (south) and proceed about 3 miles to the American checkpoint at the border. After this checkpoint, you will cross the border and proceed in the left lane to the Mexican tollbooth on Mexican Highway 15, (pay with pesos only, currently 47 pesos -they do not take dollars, exact change is better). Stay in the left lane as the lanes are divided by concrete barriers prior to reaching the tollbooth. After to the tollbooth, proceed in the left lane a short distance to the customs checkpoint and take the ‘Nothing to Declare” lane. Motor cyclists be aware that your bike may not trigger the lights and the gate, wait for assistance. Continue to the Kilometer 21 checkpoint (about 12 miles south) for your visa and vehicle permit. Stay to left or you will get stuck in the truck lane. Watch for the signs then move right and pull over into the parking area. Proceed to the immigration office on the north side of the complex to obtain your visa. If you didn’t bring copies of your documents, a copy booth is available You will need to get a copy of your newly acquired visa. Then proceed to the Banjercito (Bank of the Army) offices on the south side of the complex to obtain your vehicle permit. This will be a long building with several teller like windows facing you as you walk toward the building. You will climb some stairs to get to the windows. Double-check the VIN number on the permit. After you obtain your visa and car permit, place the sticker on the inside of your windshield behind you rear view mirror. For motorcycles, do not put the sticker on your windshield; just keep it with the rest of your papers. Exit the parking lot and continue south through the ‘Nothing to Declare’ lane and obey the red and green lights as before. You are now on the highway heading south to Magdalena. Refer to the Maps to the Rio Sonora. As you follow the signs to the border you will make a right turn and a long loop before rejoining the main highway north of the crossing point. This loop was established to prevent traffic from backing up on the main highway in Douglas. As you cross through the “Nothing to Declare” gates, observe the lights (green light continue, red light pull over at the direction of the officers). Turn right at the first intersection, just past the customs gate. Then right into the secure parking area behind the customs buildings. Park and walk around to the front of the building and enter. You will obtain your visa at the north side of the office, and then proceed to the copy booth in the center of the building if you didn’t bring copies of you documents. You will need to get a copy of your newly acquired visa. Copies will cost about $1 US dollar. Then proceed to the windows at south side of the office where you will present your copies and obtain your vehicle permit. It is important to double-check the VIN number on the permit to make sure it is correct. You may pay with cash or a credit card. Keep the sales receipt attached to your permit and keep the paper permit in a safe place. You will be required to present the permit at all Aduana checkpoints outside the free zone and when leaving Mexico. After you obtain your visa and car permit, place the sticker on the inside of your windshield behind your rear view mirror. For motorcycles, do not put the sticker on your windshield; just keep it with the rest of the papers. Exit the parking lot turning left onto Calle 1 and go 3 and a half blocks (east) to 6th Ave. Turn right (south) and continue about a mile and a half to the main highway, Mexico Highway 2. Turn right and proceed towards Cananea. Important Note:The Banjercito at Naco is only open on weekends. Thursday 4:00 p.m. to 10 p.m.
Friday 10:00 a.m. to 10 p.m.
Saturday 10:00 a.m. to 10 p.m.
Sunday 10:00 a.m. to 10 p.m. 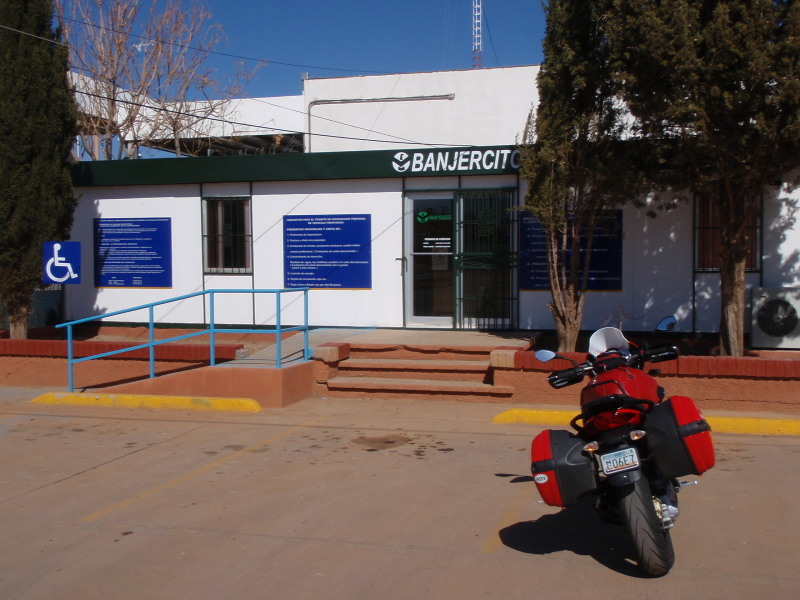 There is a Banjercito Office in Cananea but you need to get a visa in Naco first. Consider crossing at Agua Prieta during the week. Returns are easy in Cananea but the office can be hard to find the first time. Reference THIS MAP. Just before crossing, you may be greeted by US border guards asking where are you going and they may ask to look in your vehicle. Continue through the barricades and turn right stopping at the stop sign. Turn left into the ‘Nothing to declare’ lane. If you get a red light you will be directed to your right where the Aduana officials will ask to inspect your vehicle. Proceed on a green light but be aware that you may get waved over anyway. Motorcyclists – often your bike will not activate the gate properly. Wait for the agent to assist you and be careful crossing the steel ball speed bumps. Proceed through the customs gate and turn left into the parking area marked “Vehicle Permits”. Park and walk back towards the US and find the immigration office on your right and enter. If you have not brought copies of you documents, the agent at the Banjercito will make them for a $1 fee. In any event, you will need to make a copy of your newly acquired visa. You may pay in cash or with a credit card. Verify the VIN on the permit. An incorrect VIN on the permit will cause problems when you clear the permit when leaving Mexico. Before leaving the parking area, place the permit on the inside of your car windshield. If you are on a motorcycle, do not stick your permit on your windshield but keep it with the rest of the papers. When leaving the parking area, make a left (south) and proceed through the town and on to Mexico Highway 2 towards Cananea.